I received a bunch of UVO swag to try out and let you know my thoughts on so lets get right into it! What they say: Highly-respected dermatologist and surgeon, Bobby Awadalla, MD brings his extensive knowledge of dermatology and state-of-the-art expertise in skin cancer removal, facial plastic reconstruction and cosmetic dermatology to his role as the inventor and entrepreneur behind UVO. Everyone, regardless of how much time you spend outdoors, gets some kind of daily exposure to the sun whenever you go outside or even inside when you’re near a sunny window. Living a healthy, outdoor lifestyle means that you enjoy a daily sun protection regimen. We call that being SunWise. It’s all about developing a sun-avoidance thought process or SunWise habits that you practice enough that they come naturally. Drinking UVO fits perfectly into your sun-wise lifestyle – along with wearing sunscreen, SPF makeup, hats, or UV-protective clothing, using umbrellas, and sitting in the shade. 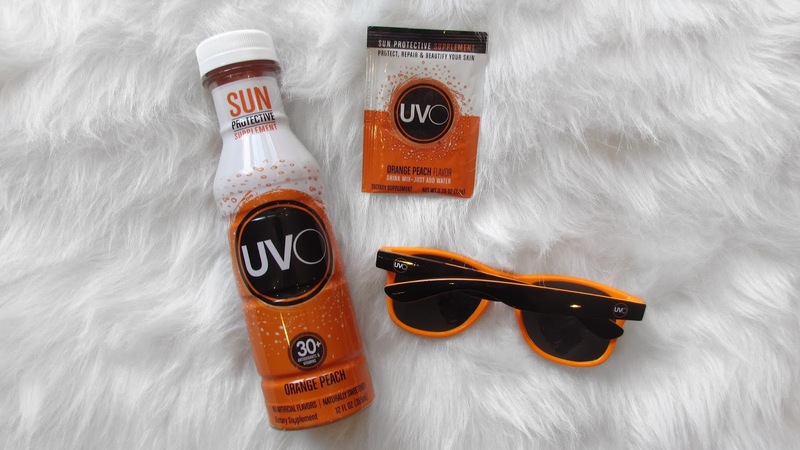 The great thing about UVO is that drinking it daily gives you continuous sun protection. The fact that UVO has 30+ vitamins, antioxidants and phytonutrients, no artificial colors, no preservatives no preservatives and is gluten free AMAZES ME. This is 100% the best tasting drink and it gives you all of these benefits is truly amazing! I can’t put it to the test just yet since its not good enough weather for me to go sit in the sun but I would happily just drink this for its nutritional benefits. I will be of course putting it to the test in the future but for now DAMN UVO, back at it again with the delicious drink! To sum things up this is amazing for everyone, if you’re someone who likes to stay inside or if you like to be outside all the time the benefits are just too good to pass up!